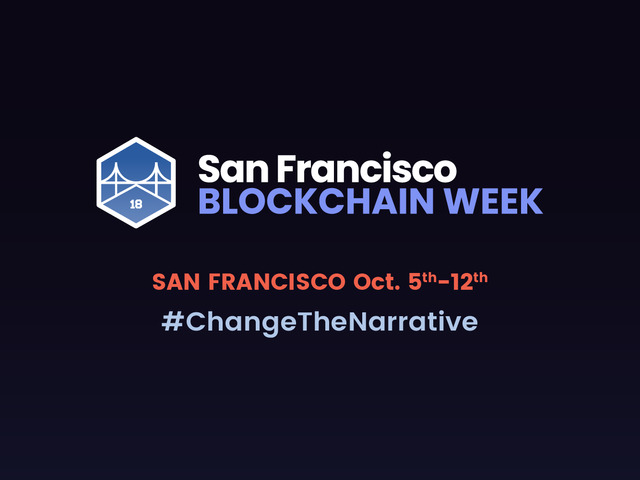 Dekrypt Capital and Noris are proud to announce the launch of SF Blockchain Week, an eight-day blockchain education and adoption conference featuring the top crypto companies in the world. Already, the event has reached 2000 registered attendees and organizers expect it to be the largest blockchain conference on the West Coast. The organizers has dedicated all their efforts into bringing the best educational content. Here is a sneak peak of the agenda. 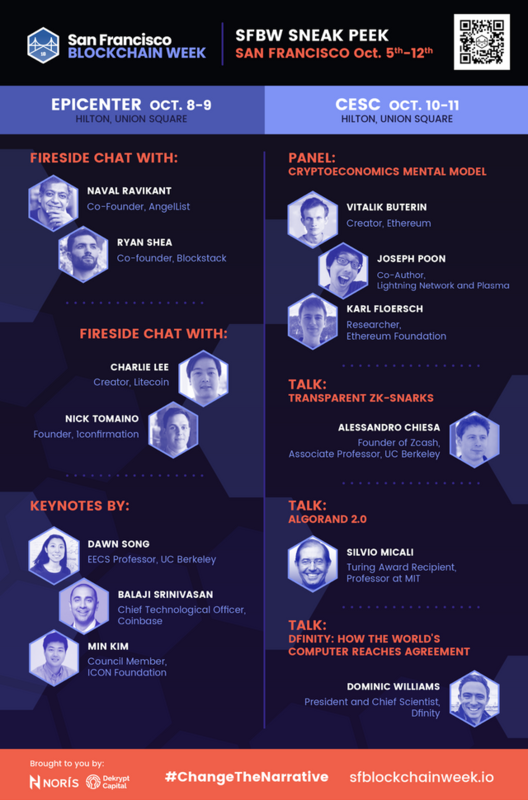 SF Blockchain Week is supported by all-star companies/projects such as ICON, Cred, Shyft, Uphold, Bitmain, PWC, Oasis Labs, Cosmos, Rchain, Carry, Kyber Network, Coinlist and many more! Here are the media partners supporting our cause. Special thanks to @Partiko for helping us spread the word among the Steem community! For more information, visit us at SFBlockchainWeek.io. Enter to win two FREE tickets to the SFBW Epicenter! Thank you all for reading! Hope to see you all at the event! You got a 90.00% upvote from @booster courtesy of @rocky666! The world really need to get familiar to Blockchain technology...it will help stop or at least slow down the GOVT from stealing from the public, finally ever cent collected can be accounted for....THE GRAVY TRAIN STOPS NOW POLITICIANS!!! We will be there @Blockchain.news ! Superb work u doing for all the cryptocurrency lovers..it's my request to all the steemit pls go and explore something new about crypto. Oooh, I'm near San Francisco that week! That will be a great move. Agreed! Thank you! For more content related to #SFBW, see The Ledger blog! @blockchain.news Blockchain have ultimate potential and will be a game changer for future technology. This type of events will help to understand the Blockchain technology in better way, As major portion of population of any country is still not aware about Blockchain and Cryptocurrency. This is a good sign of building healthy community. Is it going to be live on any internet platform like youtube, dtube etc? Very informative article in financial area! You got a 77.50% upvote from @upme thanks to @rocky666! Send at least 3 SBD or 3 STEEM to get upvote for next round. Delegate STEEM POWER and start earning 100% from your share, daily payouts ( no commission ). You got a 41.33% upvote from @postpromoter courtesy of @rocky666! I think blockchain events happen even more. 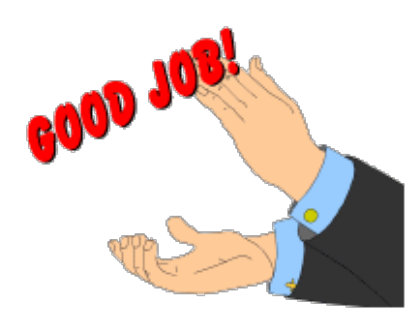 You got a 94.00% upvote from @upmewhale courtesy of @rocky666! Muy Buen Trabajo, definitivamente Blockchain se ha ido proyectando cada día con mas fuerza y gran consolidación en el mercado de las criptodivisas.. Felicidades y éxitos..
Great article! Everything is clear now, looking forward to know about this! @blockchain.news great research. Awesome information. Thanks for sharing. Keep up the good work. The blockchain will have a great economic impact. We will be waiting for your publications. Looking forward to this event for sure. So much content! Nice read. Indeed it was really a good article. Thank you for sharing this. How Work This BlockChain i Wanna Know More of this !!! excellent educational content for entrepreneurs and people who want to know more about this revolutionary technology that will soon end up covering the monetary system and global trade and the most beautiful of all is that for the first time partially unify the world in my perspective I predict a great future for humanity if we keep betting on these technologies. excelente trabajo apostando a la educación tecnológica innovando en el mundo de la web..
San Francisco Blockchain Week #SFBW - Biggest blockchain conference on the West coast! Always great to see people educating others about the blockchain. Hope the conference goes well. I think there is many useless cryptocurrency exits on blockchain. haw to start new people ...?